Houston's Hobby Airport is closed until Wednesday and it is unclear when George Bush Intercontinental Airport can reopen. 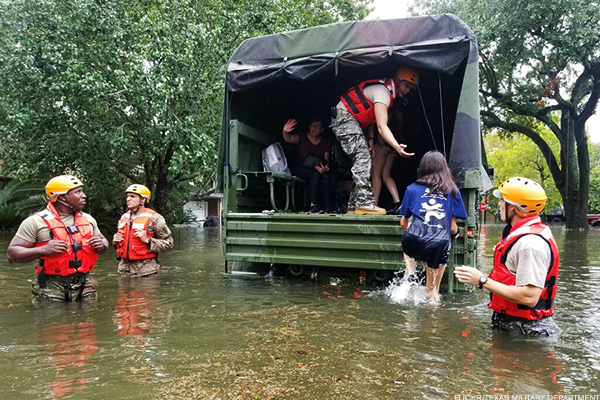 As flooding continues to engulf Houston and rain continues to fall, it remains an open question when airlines can resume service to the city. Normally, United Continental Holdings Inc. ( UAL - Get Report) operates a hub with 483 daily departures including 218 mainline departures at Houston's George Bush Intercontinental Airport. United said Sunday that it had suspended all operations at IAH until noon Monday. Shortly thereafter the Federal Aviation Administration closed the airport to all commercial flying. Aviation consultant Bob Mann said the airport may be able to open by Federal Aviation Administration definition "but not as a practical airline matter if airport staff can't get to work. "Not to mention if customers can't get to the airport, what's the point?," Mann said. As of 4 p.m. Sunday, Flight Aware said 1,699 Houston flights had been cancelled. "The biggest factor impacting HOU and IAH re-openings will be accessibility for airport and airline staff," Flight Aware said. "At this time, the majority of roadways connecting staff to the airports are impassable due to flooding." United said Sunday that "In addition to the employees we brought in earlier this week, we are working with the FAA to fly in more employees and resources from other hubs to further support and assist our team in Houston and our customers." Travel writer Joe Brancatelli said Sunday in an email: "United, the big player at IAH, says it does not expect flights to resume before 1pm ET tomorrow. Don't bet on it." At Houston Hobby Airport, primary operator Southwest Airlines Co. (LUV - Get Report) said it has suspended flights through Tuesday. Southwest offers 152 daily departures from Houston Hobby. The Federal Aviation Administration said Sunday that Hobby will remain closed until Wednesday. Southwest said Sunday it is operating rescue flights from Hobby "to move customers and employees who have not been able to leave the airport." Both carriers said they have implemented travel waiver programs that offer customers flexibility in changing flights for Houston and nearby airports. Local media reports said hundreds of travelers are stranded at each of the two airports, where flooded runways are preventing operations. Southwest said its customer travel advisory is in effect through Friday for flight changes at airports in Austin, Corpus Christi, Houston Hobby and San Antonio.